The following information was adapted from an article on brake use by Capt. Simon, UAL (Ret), and portions have been reprinted with permission. It is intended for informational purposes only and is not intended to supersede your company procedures. As always, the guidance in the in official publications should be adhered to. Many newer aircraft are equipped with carbon brakes, as opposed to the steel brakes found on relatively older aircraft. 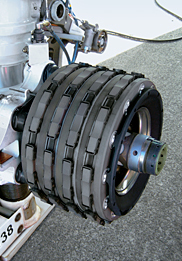 Carbon brakes have different characteristics and should be operated differently than steel brakes. They are lighter weight than steel brakes. They can absorb many times more heat during a high speed rejected takeoff. Their stopping capability improves as they are warmed up. They are prone to more wear when they are cold. They are very susceptible to wear when they are “snubbed” during taxi. 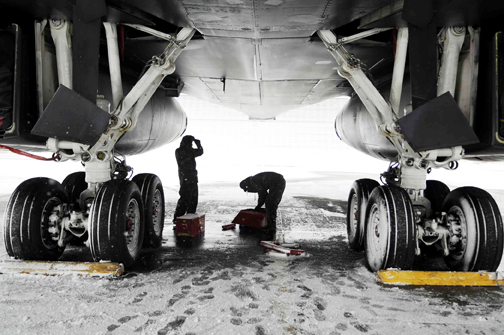 Brake assemblies wear differently depending on material and aircraft. Steel brakes can wear much more quickly than carbon brakes as heat build-up reduces the life of a steel brake. The interior of the wheel gets the hottest as it will not radiate heat as easily. Even when not braking, normal taxi will result in heat build up from friction associated with the tire rotation itself – the latter increasing rapidly as the speed is increased above normal taxi speed. This normal (non-braking) heat is highest at the tire bead and lower sidewall area as this is the area where all the tire forces terminate as well as being the thickest area of the tire. This, coupled with the landing gear loads generated during taxi (particularly during turns), are the reason many large aircraft have published taxi speed limitations. As the hottest portions of a steel brake wear the fastest, it is not surprising that the pads and linings on the inside of the brake stack and wheel will wear the most quickly. The interior linings are thicker than the outside linings in anticipation of this uneven wear pattern. Conversely, carbon brakes wear uniformly and actually perform better the hotter they get. However, activating a carbon brake when the assembly is cold wears them dramatically – the carbon brake’s “worst case” is during initial taxi when they are usually at their coldest. Despite that, if operated properly, a carbon brake wears better than a steel brake. For example 1/ 8” of wear on a carbon brake may equate to 200 landings, where the same 1/ 8” for a steel brake may only net 20 landings (depending on aircraft type). Construction of the Friction (Heat) Stack: Carbon disc against carbon disc, vs. alternating heavy steel disks and lining pads mounted on a thin disc. Slow speed stops: Carbon is “Grabby” vs. relatively smooth for steel. Taxi snub wear rate: Carbon wear is significant vs. minimal wear for steel. Taxi stop wear: Carbon wear is significant vs. minimal wear for steel. Normal stop wear: Carbon wear is small vs. average wear for steel. Rejected takeoff wear: Carbon wear is extremely low vs. high wear for steel. RTO friction level: Carbon friction increases as brake gets hotter vs. friction fading near end of RTO when brakes get hot for steel. Heat softening: Carbon softens beyond 10,000°F vs. 2,200°F for lining material in steel brakes. Relative operating temperature: Carbon temperature is significantly higher than steel for same energy level, while steel is much cooler than carbon for an equivalent energy stop. High temperatures: Carbon produces aggressive braking at high temperatures. The warmest brake tries to hog all the braking. Carbon brakes are at their best when used in a maximum effort braking situation. Brake wear factors: Steel brake wear is a function of the amount of energy absorbed during aircraft landing. Less energy (lower temperature) nets longer life. Carbon brake wear is a function of the number of times the brakes are applied and the temperature at which they are applied. Longer brake life will result from fewer applications and maintaining higher brake temperatures. Brakes are used more heavily during the landing stop. The number of brake applications is the most significant operational factor. Brake temperature (techniques that net higher relative brake temperatures) is a secondary factor. Anticipate engine spool up and spool down characteristics to avoid overshooting desired taxi speed. Combine several short taxi brake applications into fewer, longer taxi brake applications. Utilize lower level of thrust reverse. Consider shutdown of one engine to reduce idle thrust. The bottom line is that carbon brake life is most affected by the number of brake applications and how hot the brakes are during those applications. For example, if the target speed is 20 knots consider allowing the speed to build up to 20 knots and then slow it to 5 knots with a continuous braking application once or twice during taxi as opposed to maintaining the speed close to 20 knots with multiple very light brake applications. Similarly on landing, consider letting the carbon brakes heat up by getting on the binders early in the ground roll and then stay on them with continuous application until taxi speed. This article was intended to increase your brake awareness. Saving the brakes increases the odds that they will be there for you (or someone else) when really needed, however it again must be emphasized that pilots follow the official their official company guidelines. This applies to all operational procedures, not just brake use – if an incident were ever to occur, it is a whole lot simpler to defend yourself if you were doing it the way the company told you! Here is some more information on the topic. This entry was posted in Safety and tagged Carbon Brakes, taxi speed. Bookmark the permalink.